(TibetanReview.net, Jul23, 2016) – In order to halve the strength of what has otherwise been the world’s largest centre for the study of Buddhism, Chinese demolition crews, accompanied by police and government officials, began tearing down residences of students on Jul 20 at the Larung Gar Buddhist Academy in Serta (Chinese: Seda) County of Karze (Ganzi) Prefecture, Sichuan province. 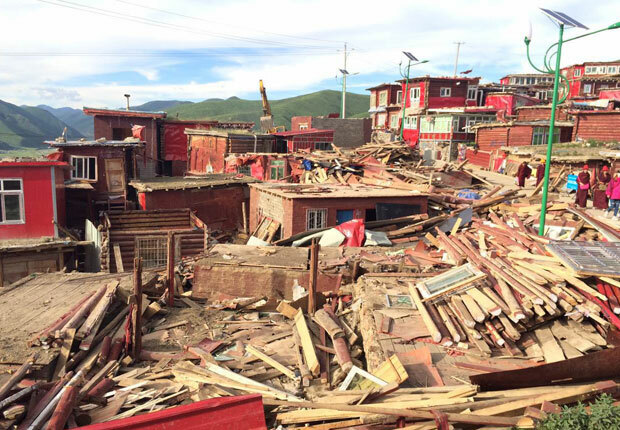 The demolition team arrived at 8 am and began with “those structures that were not already recorded in the government’s record of permitted dwellings,” reported the Tibetan service of Radio Free Asia (Washington) Jul 21, quoting an anonymous local sources. The authorities had already given notice of the planned destruction in June, the purpose being to halve the number of residential homes by demolishing more than 5,000 of them in the sprawling complex. Days before the demolition gang come in, the academy’s abbot, Khenpo Tsultrim Lodoe, had urged the Larung Gar community to restrain from resisting the planned razing of the residences, or holding protests against it. He was reported to have said in a speech whose audio recording was circulated via WeChat that protesting the central government-mandated demolition would only exacerbate the situation. While the levelling of so many houses might make people feel that “everything is finished”, the abbot has added that if people look back in a few years, they might find that it wasn’t the worst possible outcome. In order not to worsen the situation he urged people against circulating information about the demolition via social media while also discouraging protests. However, the Chinese government action has been severely criticized by Tibetan and Tibet campaign groups in the outside free world. “They are making around 5,000 monks and nuns homeless. China likes to talk about religious freedom, but their actions at Larung Gar cannot be justified. [These actions] show us how [Chinese officials] really feel about Tibetan Buddhism,” said Eleanor Byrne-Rosengren, director of London-based Fee Tibet campaign group in a statement Jul 21. Founded in 1980 by the charismatic late abbot Khenpo Jigme Phuntsog with support from the previous Panchen Lama, the mountainside academy attracts not only Tibetan Buddhist monks and nuns but also followers from mainland China as well as South East Asian countries for short- and long-term study at this ecumenical Buddhist study centre. They typically stay in a sprawling mountainside settlement made of thousands of log cabins. Government teams previously evicted thousands of monks and nuns in 2001 after demolishing their residences. But the site has continued to swell significantly over the years since then. Chinese President Xi Jinping was reported to have taken a personal interest in the move to trim the size of the monastic complex and apparently to speed up the demolition. Whereas Human Rights Watch had said in a Jun 2016 report that Beijing had planned to reduce the Buddhist centre’s student population to 5,000 by Sep 2017, the demolition began on Jun 20. An order issued by the country authorities in Jun 2016 was reported to require the academy to reduce the total number of people residing there to 5,000 people (1,500 monks and 3,500 nuns) by Oct 2017 as a part of a restructuring process required by the national government. The order was reported to have detailed a list of punishments that would be imposed if the deadline for the demolition works, to be carried out in a phased manner, were not met. These included further expulsions and even the demolition of the entire monastery.